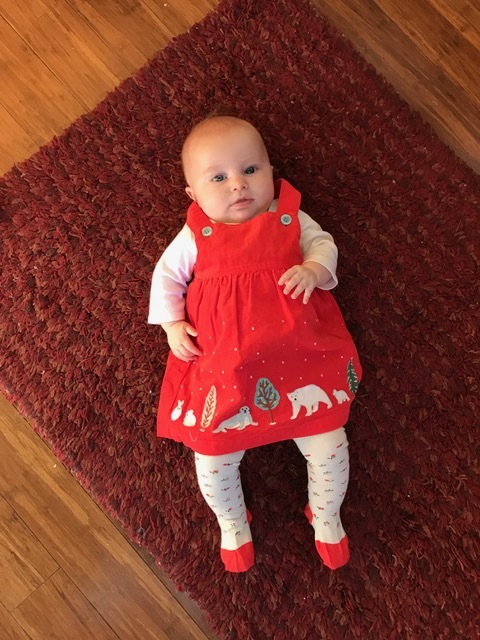 Sweet Eloise Jane, today you are FOUR months old! And the light at the end of the newborn tunnel is getting brighter and brighter with each passing day. You continue to show us that you are a pretty laid back and even keeled little lady. You are a jolly soul who adores being engaged directly and are generous with your smiles and coos. If fed and rested, you are a happy baby and also happy to have anyone hold and cuddle you. In the past month you've gotten much better about letting others soothe you even when you are tired, which is a welcome milestone! It *finally* got cold here in Austin, so I had fun pulling out your cold weather clothes! Here are your 4 month updates! How old? 4 months today! How big? 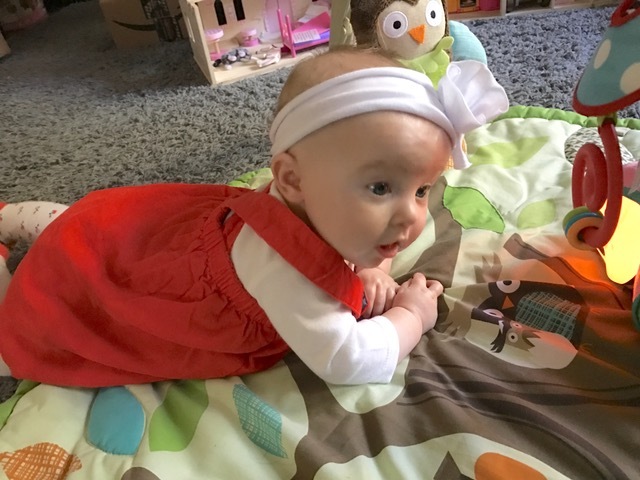 At your 4 month appointment you weighed in at 15#1oz (75%) and were 25 3/4 inches tall (98%). You have a whole 5 pounds and 2 inches over what Iyla was at this same age! You continue to be a GIANT BABY. Sleep? Ah, still all over the map! Last week you gave me three days of 5-6 hour stretches IN A ROW (which is nothing short of a miracle). However, to make sure I didn't get too comfortable, on those nights once you awoke (around 3-4am), you'd then have a lot of leg thrashing & difficulty going back down for the rest of the night. Aaaaand... in continuing my love for post vaccination sleep, on the night you got your shots you slept EIGHT HOURS STRAIGHT. I could not believe it! 9:30-5:30am. Unfortunately it was short lived, and since then you are back to 3-4 hours being your longest sleep stretch. Sorry to say kid, but sleep camp is in your near future! Now that I KNOW you can survive without eating for 8 hours, we are going to help you learn to self soothe and break bad habits so we can all get better rest. Naps are still frequent and brief, on the every 2 hour cycle where you'll take a mini 30-40 minute snooze after eating and playing. Papa has been taking the night shift with you on Friday nights- where after we do your bedtime routine he takes you to the 3rd floor while I get a full nights' sleep (getting up to pump and leave more bottles throughout the night). It's AMAZING, and truly the best gift anyone could give me! Eating? I would still call you voracious! You eat every 1-2 hours all day long and are getting more and more chubs on you. You love your bottles, and seem to prefer those in the evening. I've purchased a canister of formula and plan to start introducing that soon, as an option for nighttime bottles as well as bottles when I am away. *Rolling! You rolled for the very first time on November 1st, then not again until November 17th when you rolled both ways from your tummy. -The dinosaur roar! You are experimenting with how LOUD your voice can be and do these crazy loud and long calls that are hilarious. -Blowing raspberries. You love making spit bubbles and pretty much do this all day every day lately. -Your first giggles on November 17th! They were elicited when I turned my head away from you, then quickly looked at you and said "boo!" So.cute. *"Talking" with people. You love to make direct eye contact and engage with those around you. *Your baby swing. This isn't 100% a love, but you do often like to tranquilly of sitting there rocking and looking out the window, then will often follow that time with a little nap. *Ceiling fans. Always the ceiling fans! *THE CAR. Alas, you still tend to cry bloody murder in the car. We are getting occasional rides where you'll be content for short periods, but those periods are always brief before the fussing begins, which then will escalate into hysterics. And days where we have more than one stop in a row? Those are torture for everyone! Wednesdays are the worst, as they are swim lesson days where you have to ride to Iyla's school, then to swimming, then back home. It is a LOT for you. I've noticed you tend to reach out and explore things first with your left hand. And while I know it is early to know for SURE which hand will be dominant, I'm curious if that is an early sign. Your Papa is left handed as are both of your grandmothers- so there is definitely a very good chance you could go that direction! *The extreme postpartum hair loss is in FULL EFFECT. I am losing hair at a rapid rate and finding stray hairs constantly on my clothes, you, the shower drain, etc. *I am now 10 pounds away from my pre pregnancy weight- slowly but surely getting there! My wardrobe staples right now are leggings, tunics, and maternity jeans. I do actually fit into several of my pre pregnancy jeans, though they are tight and have a lot of skin hanging out the top! You'll note the gray hair Mohawk going strong along my part. I'm looking and feeling all of my 41 years lately! Your big sister absolutely ADORES you and constantly wants to snuggle and kiss you. We love you so much sweet Eloise Jane! Happy 4 months to you! 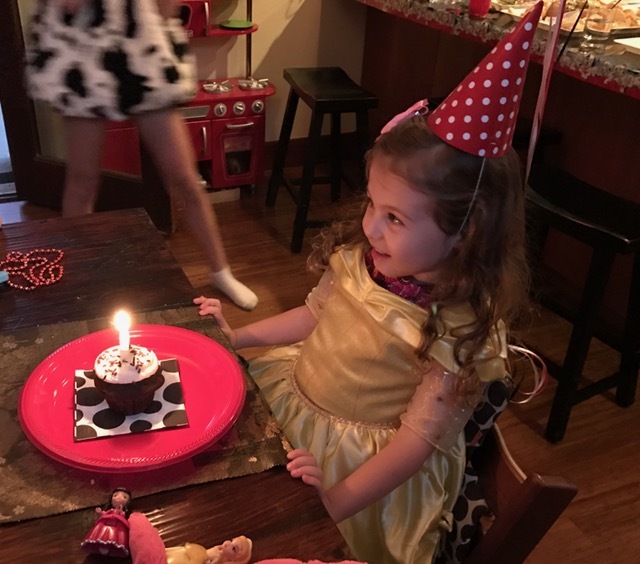 We celebrated Iyla's birthday all weekend long, and it was so much fun! On Friday night I asked her where she'd like to go for her birthday dinner, and without hesitation she said "Guero's" (a Tex-Mex spot), followed by Amy's ice cream. And so it was! Happy girl eating her chocolate ice cream with "chocolate fudge." 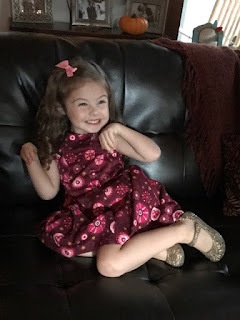 She had breakfast out with Papa at Sawyer and Company- pancakes & chocolate milk- then returned home to anxiously await Mimi and Grampy's arrival and get into her official birthday dress. Then it was time for the party to begin! Iyla had 5 little friends come, in addition to cousin Sammy and another little 1 year old named Hazel. As each friend arrived, we had them choose a princess dress to put on in an effort to unite the group. Our friends Andy & Lily came dressed as Cruella Deville and a dalmation which Iyla LOVED (and which I wish I would have gotten a photo of)! Left to right, Sabine, Iyla, Eila, Juliette, and Ada behind. Friend Fiona isn't pictured here. After everyone arrived the girls played for awhile, and then Lily corralled the gang up into Iyla's bedroom for games & story time. She was an amazing helper! 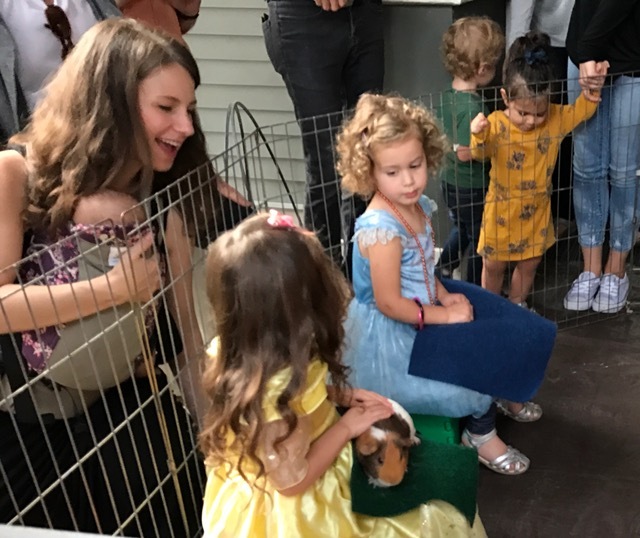 At 4:30 the Tiny Tails to You petting zoo arrived, and everyone got to take turns holding little animals. It was a big hit and pretty hilarious. I felt bad for the woman running it, as the kids would each be handed an animal and within 30 seconds yell out "done!" and demand a different one. She was doing an amazing job multi tasking with all those 4 year olds. Little Juliette was the exception to the crowd- she stayed seated the ENTIRE time and held each animal as long as she could. It was super cute. After the petting zoo it was time for cupcakes! On Sunday Iyla had a great time playing with all of her new toys and with Mimi and Grampy, who had stayed the night. Eloise enjoyed the visit too! New toy pet dog named "Georgie"
We took our first walk in the Double Bob on Sunday afternoon, and Iyla thought it was the most fun thing in the world! Happily Eloise slept through most of the stroll (vs crying). The two of them were so adorable riding side by side. We then finished up the birthday weekend with more cupcakes and singing, of course! 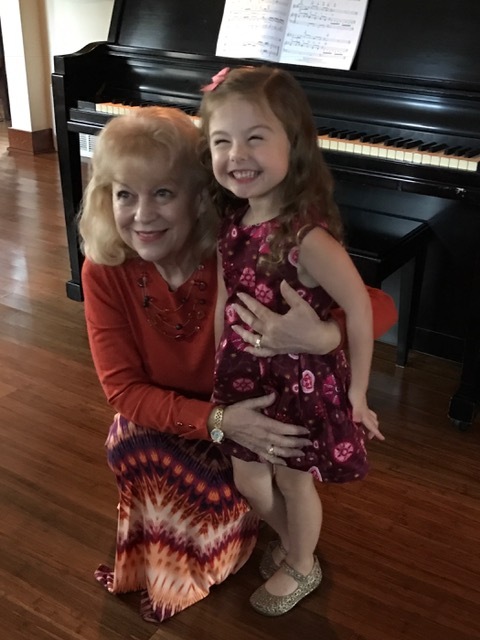 It melted my heart to see how thoroughly Iyla enjoyed each part of her birthday weekend. 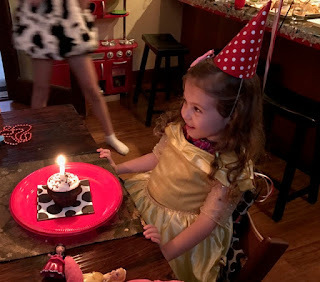 It was a wonderful celebration for our sweet 4 year old girl!